Instagram on Monday launched live video streaming for all users in the U.S., while its parent company, Facebook, added 360-degree video support for its own streams —though initially in a limited capacity. 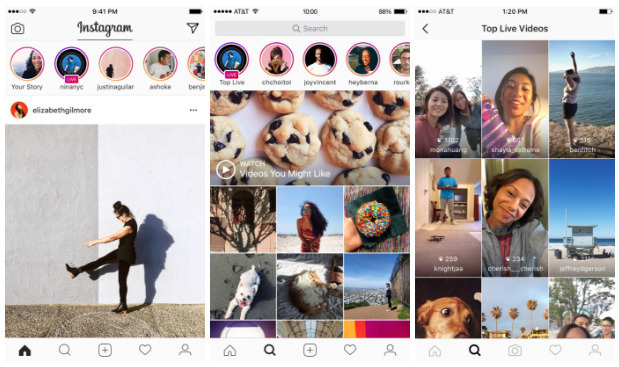 As promised, Instagram's live content is integrated into Stories. Bringing up the app's camera now offers an option to broadcast. Unlike Facebook, though, live Instagram feeds disappear as soon as recording finishes. Live support was originally teased in late November. At the time, Instagram said only that it would roll out worldwide during "the next few weeks." Facebook's live 360-degree videos are set to debut on Tuesday with an inaugural broadcast from the Mars Desert Research Station in Utah, done in partnership with National Geographic. At first, the technology will only be seen through publishers. Even when it does open up, affordable 360-degree cameras will be rare, more so those supporting live streaming. Facebook has leaned heavily on live video in 2016, treating it as tentpole feature. Upgrading to 360-degree video may help bolster the initiative as well as its Oculus VR business, which earlier this year shipped the Rift headset and more recently its Touch controllers.